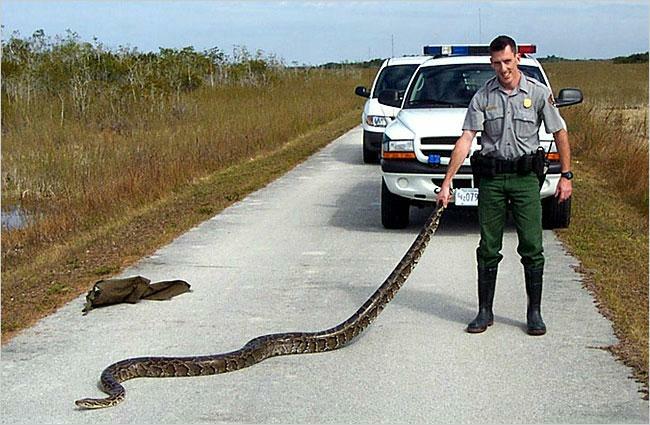 Giant Burmese pythons have already established themselves across thousands of square miles of Florida's Everglades, where outdoor workers now routinely find them. The state had held out hope that bays, inlets and open seas would form a natural barrier, keeping the non-native snakes, often discarded pets, from ------ing to the Florida Keys and beyond. But that might not be the case. Research published this week finds that even newly-hatched pythons can survive in seawater for up to a month. "The fact that this study has ruled out one of the most hoped-for forms of physical barriers, saltwater, as preventing the ------ of invasive pythons in Florida puts even more onus on human action to prevent the ------ of these damaging reptiles," U.S. Geological Survey Director Marcia McNutt said in a release. "This study demonstrates the distinct possibility that pythons could ------ to new suitable habitats one estuary at a time." Researchers with the U.S. Geological Survey tested the ability of 24 hatchling Burmese pythons that they had caught in the Everglades to survive given different types of water to drink. Some got fresh water, some brackish water (such as the slightly salty water found in mangrove swamps) and some full-strength seawater. For Sale: GIANT 3-Foot WING!! Dyno charts INSIDE! !